It seems like just last month that we had the BlackBerry 8900 to play with, and now there’s a new one lurking in the wings. 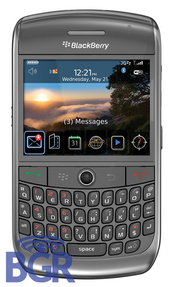 Say hello to the 9300, codenamed the Gemini. At least this time it’s equipped with 3G (which was a very strange omission in the 8900). Specs are quite hazy but we can confirm a couple of things. Firstly it will have a bigger screen than the 8900, plus a much higher resolution, which should give us sharper images. It’s going to be available in silver, and there are a couple of changes to the keys as well, with the send and end keys being rounded rather than flat. And that’s about it folks. Yes, it does manage to bundle in a 3.2 megapixel camera, a (hopefully) stronger processor and the usual GSM/GPRS and HSDPA functionalities. It’s sad there’s nothing particularly exceptional about this offering, but the return to 3G will definitely be appreciated by many.